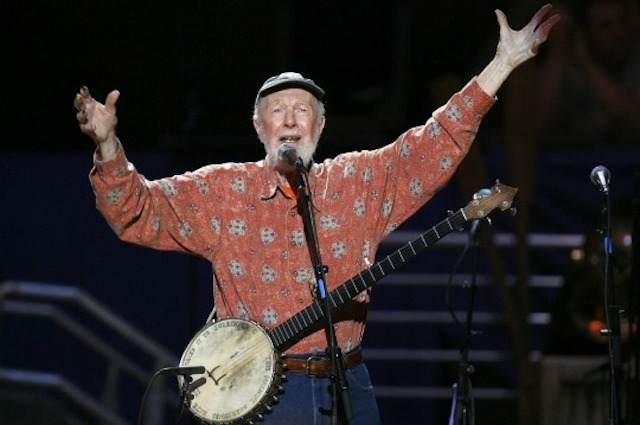 Music Legend, song writer, passionate environmentalist, and peace activist Pete Seeger sadly passed away on Monday 27th January. 2014. He was 94 years old. Seeger died of natural causes at a hospital not far from his longtime-home, Beacon, New York. Seeger’s grandson, Kitama Cahill-Jackson, said his grandfather died peacefully in his sleep around 9:30 p.m. at New York Presbyterian Hospital, where he had been for six days. Family members were with him – Associated Press. Seeger was a notable banjo and guitar player who in his early career toured the country with Woody Guthrie. He came to prominence through the folk music revival of the Twentieth Century, playing for audiences and children all over the world. He was a key figure in the folk group the Weavers. In 1949, Pete Seeger, Lee Hays, Ronnie Gilbert and Fred Hellerman started working together as the folk group The Weavers. They were signed to Decca Records by Gordon Jenkins, who was the company’s music director and an arranger for Frank Sinatra. His career, spanned nearly eighty years. He delivered support for labor struggles, the civil rights movement, anti-war campaigns, and environmental causes with his banjo nad his music. His political activism and was a consistent voice against war, destruction, and oppression. Seeger spent many years exiled by the country’s powerful, but never that to deter his commitment to justice, beauty, and the power of music to bring people together. My job is to show folks there’s a lot of good music in this world, and if used right it may help to save the planet– Pete Seeger 2009.